Karl Mayer is increasingly participating in trade fairs that focus on applications and end-uses. A leading German textile machinery manufacturer was exhibiting for the first time at the ISPO sports trade fair, held from 3-6 February in Munich. With its modern, welcoming design and wide range of products to attract visitors, Karl Mayer’s stand quickly became a magnet for the public. The team of experts from the company’s Textile Product Development Department welcomed around 400 visitors from home and abroad. Many of them were specialists with specific issues to discuss, and just under 150 high-quality conversations were recorded. Most of the visitors were curious to examine the attractive presentation of selected warp-knitted textiles on show. 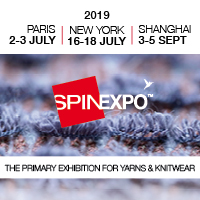 A range of innovative, warp-knitted spacer textiles with 3D patterns, air-permeable jacquard designs, and a shoe style with the design fully integrated into the surface were being showcased. Rascheltronic textiles, designed to deliver compression and breathability in the same piece, stretch, sporty lace items and functional, warp knitted meshes were also on show. “Our counter display proved to be a real attraction. Many of the visitors stopped, touched the fabrics, and wanted to know more about their production and performance,” said Gabriela Schellner, the Head of Textile Development. She discussed interesting, new concepts and exchanged ideas about the latest trends, especially with international brand manufacturers. Many of the visitors also took the opportunity to look around Karl Mayer’s Virtual Showroom using the mega-touchscreen. Another highlight was a battle between two mini-robots, controlled by a textile remote controller, which the visitors could try out for themselves. The electrical control technology needed to produce this was incorporated directly into the textiles during production on a jacquard raschel machine. The onlookers to this spectacle included fabric producers, as well as brand experts and end users. Most of them were from the sports sector, but many of them were also operating in the medical and protective clothing sectors and were looking for inspiration. Their interests were equally as wide and varied. “Some of them already had very specific product ideas, whereas our samples were the first time that some of them had encountered the concept of using textiles in the electronics sector,” said Sophia Krinner, a member of Karl Mayer’s exhibition team. In the near future, this textile product developer aims to follow up a number of contacts, with a view to taking concrete steps towards cooperation.